Richard Ortiz is leading by example. A third-generation Mexican-American, he is big brother to three sisters. As the first person in his family to attend college, he is showing his siblings that it can be done well—and affordably, thanks to the Cal Grant. 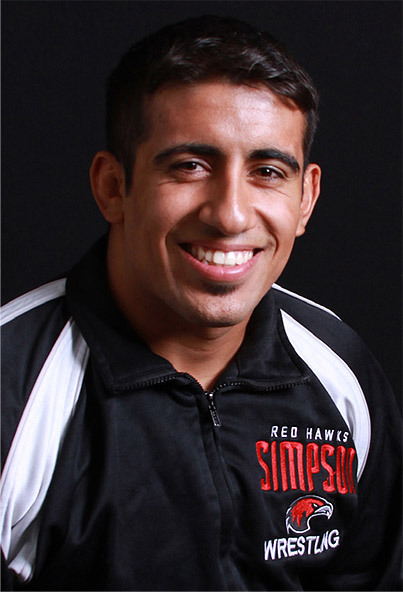 Richard, who is from Santa Clarita, learned about Simpson University, a private, faith-based college in far Northern California, through an online search for colleges that offered competitive wrestling. His skills as a four-year varsity wrestler in high school helped him earn an athletic scholarship. And the Cal Grant, which he qualified for his sophomore year, has meant more peace of mind for him and his parents. Richard has taken full advantage of the opportunities a smaller university such as Simpson offers students. In addition to double-majoring in business administration and accounting, he is a resident assistant on a men’s floor and has traveled to Southeast Asia twice on student-led service teams, helping dig wells and level out soccer fields, among other projects. This spring he will travel to Spain to do volunteer work. Outside the classroom and residence hall, Richard has also been on a force on the wrestling team. Last season he placed fourth at the NAIA (National Association of Intercollegiate Athletics) West Regionals and qualified for nationals. He earned the NAIA’s Champions of Character award and the Simpson University Red Hawk of the Year award for his academic and athletic excellence. The California Legislature Assembly has recognized Richard twice for his high grade-point average. He has earned Dean’s List recognition for having a 3.5 or higher GPA. Richard’s overseas experience has piqued his interest in international accounting as a career. He knows the value of a college education and is hopeful his sisters will follow in his footsteps. Marybel Torres’ desire to teach and help the children in her community took her on a journey to earn her B.A. in liberal studies through Simpson University’s School of Adult Studies, ASPIRE degree-completion program. In addition to being a full-time student, she works multiple jobs and is busy raising her children, Deanna, 5, and Jesus Jr., 4. “Teaching has become my passion, and Simpson is that big step which will allow me to achieve my dream,” she said. Before the 31 year-old Gerber, Calif., resident started college, Marybel worked as a waitress to help support her family after her father suffered a serious back injury. When she was 21, she was hired to work in the SERRF (Safe Education & Recreation For Rural Families) Afterschool Program at Los Molinos Elementary School. Even though she had no teaching experience, Marybel’s bilingual skills as a Mexican-American made her an asset in the classroom. 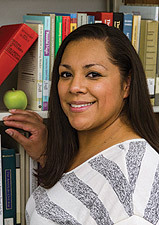 Marybel started taking classes at Shasta College in Redding in 2003, and over the course of 10 years, earned associate degrees in human development and language arts. She was the first person in her family to go to college. Marybel planned to transfer to Chico State to finish her bachelor’s degree, but ever-changing transfer requirements kept putting that goal out of reach. Marybel first visited Simpson in April 2013 when one of her classes at nearby Shasta had been cancelled and she had time before her next class. That same day, Marybel decided to transfer to Simpson. She started classes in May 2013 and will graduate in January. She plans to begin credentialing classes through Simpson’s School of Education this fall and eventually teach at the elementary-school level. Marybel is part of a 16-month-long liberal studies degree program that meets one night a week, a typical format for the ASPIRE program, which is designed to provide affordable and convenient schooling options for working adults to complete their bachelor’s degrees. Marybel also enjoys the cohort set-up of the ASPIRE program. The scholarships Marybel receives includes Simpson’s Extended Opportunity Programs and Services/Care scholarship, which covers 60 percent of her tuition. She is grateful for this financial support. James Pope Jr. first heard about A.W. Tozer Theological Seminary while he and his oldest son were touring Simpson University’s campus with former Simpson accounting professor Jerry Stayton and his wife, Peggy. He was immediately intrigued—Tozer is one of his favorite authors. “My thought was, ‘How cool would that be if I could attend an institution that may perhaps help me to know and love Christ like this man did?’” he said. The dream was a long shot at the time. 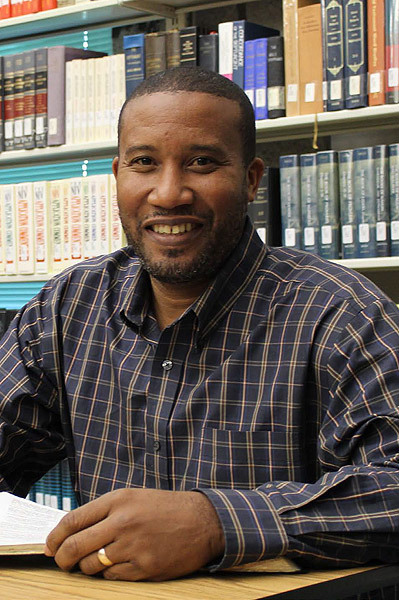 James had only completed an associate’s degree in biblical studies from Horizon Bible College in San Diego, so he had put higher education on hold. But several years later, he was offered the opportunity to go to Tozer Seminary if he read 15 books and wrote a thesis paper in a two-week period. "I asked my senior Bible study to pray for me, and the next day when I returned home from work, half of the books were on my doorstep waiting for me," he said. "I said, 'All right, Lord – let’s do this!'" After completing the assignment, James was offered the opportunity to attend Tozer Seminary. "I was blown away and am still blown away," he said. In May, he will graduate with an M.A. in Intellectual Leadership. He is also on track to complete his Master of Divinity in the summer of 2015. "My hopes in my Christian education are to leave someone with a thought about Christ that stops them dead in their tracks while causing their heart and minds to begin tracking with Christ onward to repentance and newness of life," he said. Before coming to Tozer, James worked at Nordstrom Department stores for 14 years. He was also the radio and bookstore manager and a pastoral intern at Horizon Christian Fellowship. He later served as an inner-city Bible teacher and youth counselor for Htown High School in San Diego through Horizon Christian Fellowship and became a board member of Caring Ministries (substance abuse rehab) and an administrative pastor at Horizon Park Chapel. 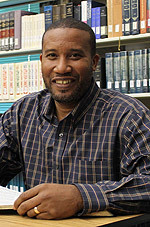 James now serves as an associate pastor and the senior Bible study facilitator at New Vision Christian Fellowship and as the manager of programs and case manager at the San Diego Rescue Mission, where he helps develop programs and works with men dealing with homelessness, drug and alcohol abuse or addiction, and mental-health issues. The San Diego Rescue Mission provides its year- and 18-month-long residents with biblical counseling, case management, marriage and family therapy, work therapy, educational opportunities, and faith-based services. "James Pope is a gentle giant who always cares for his flock at the rescue mission," said Dr. Patrick Blewett, dean of A.W. Tozer Theological Seminary. "He loves the Lord and is gracious; he loves to study God’s Word. I think James is an excellent example of the type of leader that A.W. Tozer Seminary is producing." James said he has been able to apply what he has learned at Tozer to his professional life, especially the material from the course Counseling the Addicted. "I have had opportunity to share materials and knowledge that I have gained from that class to others,” he said. “I do think that every person in church could benefit from this class as everyone is affected one way or another by addictions of all sorts, either personally or will be affected by someone they know." As a father of four, James wanted to set a positive example for his children, James III, 21, Zachariah, 19, Mackenzie, 17, Kiley, 15, by working hard while in school. "My kids have watched me these past four years laboring and studying and they have all become great students," he said. "I know that my wife, Julie Anne, had much to do with this but, I think that witnessing dad study and work hard has also encouraged their work ethic as well to some degree." James is grateful for the financial support he receives from donors to attend seminary, including the Bud and Rosemary Tozer Memorial Scholarship. "Your labor and acts of love are not in vain," he tells those who give to help students such as him. "Your financial investments and prayers in the kingdom of God are going to produce ten-fold, so don’t stop doing what you do. I am grateful for your investment in me and all of my peers. It has also produced a desire in me to give back." This article was featured in the spring/summer 2014 Transform newsletter.